Check out our low prices Koozies, that will insulate your beverages in a collapsible sleeve keeping your drinks cold and your hands warm. The convenient collapsible sleeve allows the can koozies to be carried in a pocket or purse. These insulated beverage holders are made of a light weight foam material and available in 26 colors including two kinds of camouflage for hunters or sportsmen. Fits most 12 ounce cans or bottles. Low priced Koozies make a perfect give-away promotional item, with your name printed on them. Our Koozies are made in the USA. Price includes a one-color imprint on both sides and bottom. Personalized Imprint area for your custom message on sides is 3" x 3". An optional bottom imprint area of 2" diameter is also available. Insulated can holders are one of many promotional handouts we offer. Be sure to check back often to see new advertising products waiting for your personalized custom imprint. 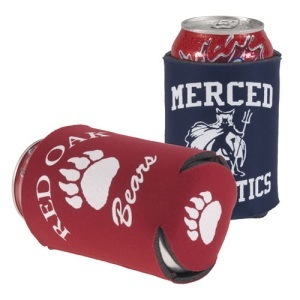 These items are also called custom imprinted can koozies, can holders, or printed can huggies. Put your message or logo on one today. Can coolers are the perfect promotional product for anyone. These promotional products keeps your beverage warm or cold.